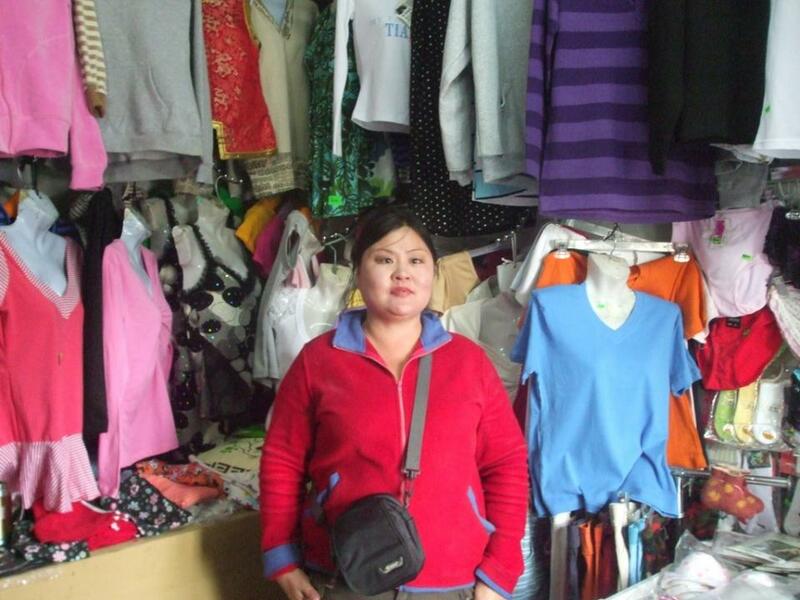 A loan of $850 helped to purchase more clothes from Ereen, China. Narangerel B. lives with her husband and three children in the Chingeltei district of Ulaanbaatar, the capital city of Mongolia. Her eldest daughter goes to a university in Ulaanbaatar and her other two children are both high school students. Narangerel has a small business in retail clothing. She rents a small stall in a local market and retails various women’s and men’s clothes. She mostly purchases clothes that are made in Mongolia, from the wholesale markets in the city. She now would like to expand her business by adding more variety of clothes to her stall. She would like to import cheap clothes from Ereen, China, a border town from where many cheap Chinese products are imported to Mongolia. Narangerel requests a loan to purchase more clothes from Ereen, China. This loan is being administered through XacBank, a Mongolian for-profit microfinance institution. XacBank is located in every province of Mongolia, reaching some of the most rural micro business clients. With this Kiva loan, there is an opportunity for the entrepreneur to get a savings account including 9% of the interest if they pay back the loan on time. This is a special savings account that XacBank has specifically prepared for the Kiva loan borrowers to promote savings habits. XacBank is committed to a socially-driven model of microfinance, offering relatively low interest rates and repayment schedules adapted to client needs. The bank’s relationship with Kiva has allowed it to get environmentally-friendly products in the hands of more people, including energy-efficient stoves, solar power kits and more. Kiva is also thrilled to be working with a partner that facilitates savings for its clients by opening up new savings accounts with 9% of the interest paid on loans. This helps clients develop a lifetime of sound financial habits while building upon future entrepreneurial activities.